Essays by Mary Kathryn Addis, Spanish and Women's Studies; Eric S. Moskowitz, Political Science and Director of the Luce Leadership Program; Mark R. Weaver, Political Science; Raymond G. McCall, Emeritus, English and Theatre; and Annetta Louise Gomez-Jefferson, Emerita, Theatre and Black Studies, all of The College of Wooster. 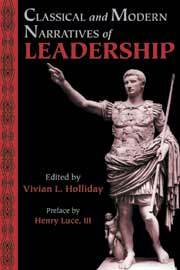 Classical And Modern Narratives Of Leadership is an impressive and scholarly collection of outstanding essays ranging across history from Pericles to George Bush. The insightful and informative contributors offer suggestions for the creative application of leadership skills based on both historical and contemporary examples. Classical And Modern Narratives Of Leadership invites readers to view leaders not only as the narrators of their own stories, but also the stories of the leaders (and followers) in every community and for each age. Classical And Modern Narratives Of Leadership is rewarding reading and highly recommended to students of historical and contemporary political, and cultural leadership.